* Size: 1.625 in. x 3.125 in., smaller than a credit card. 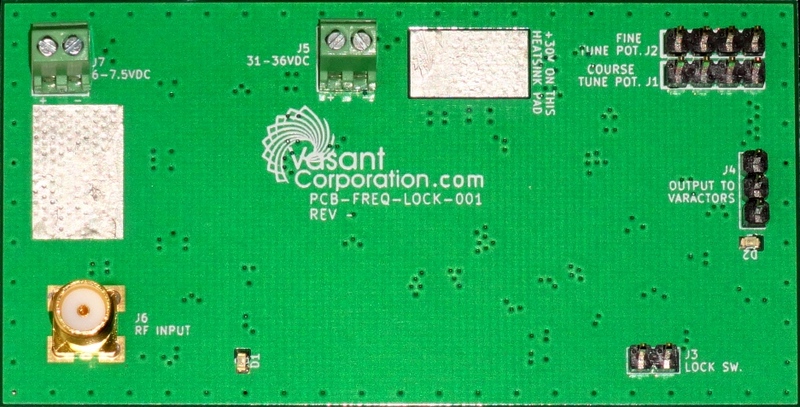 * Two layer cards with GND plane and I/O connections on the bottom side. * Optional top side EMI shielding cover. * EMI cover also performs as a dirt and water shield to make modules water resistant. 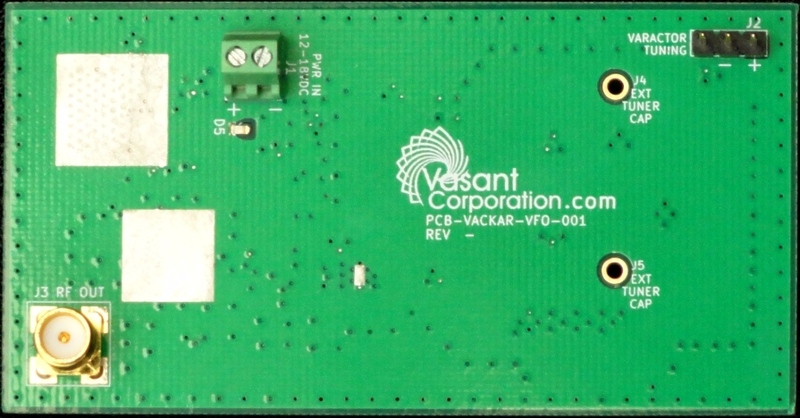 PCA-VACKAR-VFO-001, Vackar variable frequency low phase noise oscillator with 1 octave range and output on SMA jack. PCA-FREQ-LOCK-001, High performance Fast Huff Puff frequency lock circuit. PCA-BAND-SELECT-001, 8 octave band selector with three I outputs and three Q outputs on SMA jacks. PCA-BAL-QSD-001, Balanced Quadrature Synchronous Demodulator with analog AGC I & Q low noise amplifiers. PCA-BAL-QSM-001, Balanced Quadrature Synchronous Modulator with estimated 0.5 watt output, not tested yet. PCA-SWCAP-LPFILTERS-001, 4 sets of 16-Order LP Filters, 2 for REC I & Q and 2 for XMT I & Q with REC and XMT corner frequencies independently adjustable. PCA-SSB-WEAVER-001, has a REC set of WEAVER multipliers+summer and a XMT set of multipliers+summer, with independently selectable USB or LSB. PCA-AGC+IQAMP-001, Automatic Gain Control circuitry and a 2nd stage of AGC controlled I & Q low noise amplifiers. PCA-PWMATTN+BLNKR-001, This module applies synchronized pulse width modulation to the quadrature decoder's I and Q VFO frequency clocks so as to reduce the amplitude and bandwidth of the decoded I and Q samples. This module provides both manual and automatic PWM attenuation level control. The module also provides fast blanking of strong signals or noise with adjustable threshold and hang time control. In addition, it provides a delayed blanking signal specifically for blanking repetitive noise with adjustable delay followed by an adjustable blanking duration. PCA-CLASS-E-PP-PA-001, Balanced Class E Push-Pull Power Amplifier, with snap ON snap OFF MOSFET RF drive, power output TBD, not tested yet. Input and output transzorb protected. Input DC power up to 18V safely. If properly adjusted, up to 28VDC before RF gets clipped by transzorbs. PCA-BALHIZLNA+AMDET-001, Balanced high input impedance Low Noise amplifier, can be used across balanced receive antenna terminals. Front end has voltage controlled varactor tuning to set antenna resonance. This module also includes an AM detector for use in driving a noise blanker ahead of any AGC circuitry. This greatly reduces how much the AGC level gets knocked down by transient noise. 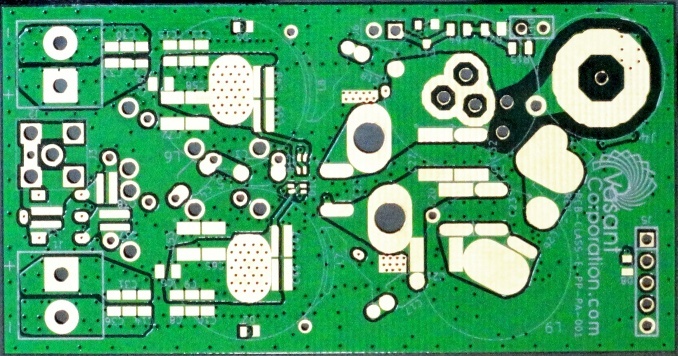 With an impedance matching transformer, the module may also be use as a 1st stage RF amplifier in the receiver instead of at the antenna. PCA-AUD-IO-001, Has the following circuitry: Differential microphone input with jumpers for adding phantom power out, mic. processor with noise gate level adjust, AGC level adjust and compression level adjust, has mic. line level differential out. Transmit/Receive select circuit with PTT, Hotmic and Auto transmit mode based on mic. audio level, with adjustable mic gain and adjustable automic threshold. This includes transmit tail time adjust. This module also includes received audio squelch processing and optional jumper selectable auto transmit inhibit mode to hold off the beginning of a transmission during ongoing reception of a signal. Received audio triggers a receive squelch tail with its own tail time adjust before auto mic transmit can engage again. "PTT" always responds immediately and "Hotmic" forces constant Transmit mode. Automic/, PTT/ and Hotmic/ mode select inputs are active low Gnd/Open inputs with on-board pullup resistors.